This has certainly been a momentous occasion as this is the last time we will be upgrading Windows from one version to the next. From this point forward the updates will come in periodically, no more waiting for a big upgrade install every 2-3 years. I’m very excited about that. Being such a momentous occasion there are a few things I thought I’d share to help make your upgrade process more momentous. I’ve upgraded several machines to Windows 10 using several different methods. Overall, I’m very pleased the last time I have to do this is going to smooth. Granted, I’ve heard of issues, mostly with driver compatibility, but for the most part Microsoft seems to have gotten this one right – since you know, it’s the last time. My first upgrade was my Surface Pro 2. Yes, I still have a 2. I’m holding out for the Pro 4 that comes with Windows 10. This upgrade was done via the upgrade notification icon that appeared on the taskbar. Windows downloaded the necessary files in the background and I just clicked Next a few times and bam, Windows 10. It took less than 30 minutes and was seamless. I don’t see any need to wipe out and start over again with a clean install as the in-place upgrade worked perfectly. I know the purists will say otherwise. The one thing to note here is to uncheck the box that says you will share your Wi-Fi connection with your contacts. While the Wi-Fi sharing feature is kinda cool it has been known to disable some network adapters that don’t fully support it so to be safe just turn that off. You will need to click Customize and not accept the default settings as you click into Windows 10. My second upgrade as on my desktop at work. This is a Dell Precision line computer with 2 normal spinning hard drives running in a Raid 1 configuration. No SSD like with the Surface. This upgrade was done using the Windows 10 Enterprise ISO downloaded through a VLSC account. This upgrade was easy as well but it took a lot longer. The upgrade process itself took an hour and a half followed by 3 hours of 100% disk I/O. I can only theorize that the traditional hard disks, the RAID configuration, and the fact that my work machine has a lot more apps on it caused the upgrade to take longer. I found that it was best to just let the disks run at 100% until Windows finished what it was doing as setting anything else up took excessively long. Once it finished the disk, activity went back to normal and Windows 10 works great. Another in-place upgrade that saved me a ton of time, as I didn’t have to re-install everything and re-configure everything. Again, the purists would have done a clean install but I don’t have their kind of time. In all these upgrades, I haven’t experienced any driver issues or had to manually install any missing drivers. I also haven’t had any features not function properly requiring me to roll back to Windows 8.1. I know others have had issues and had to roll back on a variety of different hardware but I don’t have enough data to know what was to blame in those situations. One setting I did change was the Windows Update setting. With Windows 10, either you get the updates automatically and Windows just reboots and does it for you or you can set it to prompt you to reboot. I often leave my machines locked doing various things overnight so I set mine to prompt me. I did leave it to Automatically Update for a while but found it was closing Outlook and all my apps and rebooting in the middle of the night on its own and I didn’t care for that. It is great having the same OS on my desktop and my Surface. I love the new Start Menu and enjoy that many of the features and configs sync between the 2 devices. It is also exciting know that Windows 10 is a product that is evolving. Unlike previous version where development stopped until the next version comes out Windows 10 is already showing its flexibility as the OS is updated with new things all the time. This is Windows as it should be. I also like that they are still accepting feedback via a built in app in the OS. Anytime I stumble across something I don’t like I check to see if anyone else has already submitted the issue and if not I submit the suggestion. I find I’m often late to the submission party, as so far all of my ideas have already been submitted by people much smarter than me. My latest article is now live at ministrytech.com. 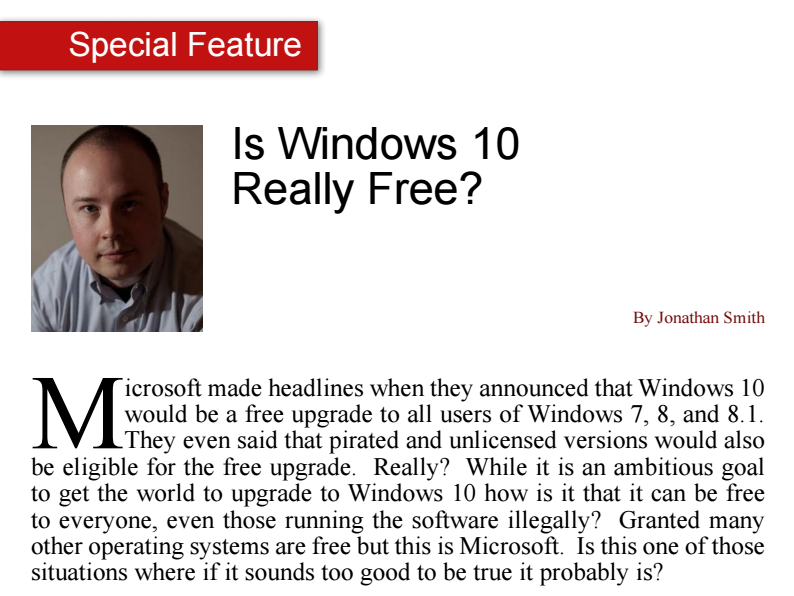 Microsoft made headlines when they announced that Windows 10 would be a free upgrade to all users of Windows 7, 8, and 8.1. They even said that pirated and unlicensed versions would also be eligible for the free upgrade. Really? While it is an ambitious goal to get the world to upgrade to Windows 10 how is it that it can be free to everyone, even those running the software illegally? Granted many other operating systems are free but this is Microsoft. Is this one of those situations where if it sounds too good to be true it probably is? In a word, yes. Microsoft has several times had to clarify what they actually meant. In other words, they didn’t mention all the catches to the announcement that Windows 10 would be a free upgrade to all users of Windows 7, 8, and 8.1. Knowing the complexity of Microsoft licensing, including educational and charity options, I was surprised that Microsoft would make the upgrade process harder by not clearly communicating how you get the free upgrade. So how do you get your free upgrade if you are running Windows 7, 8, or 8.1? In order to answer that we have to know how you got the copy of Windows 7, 8, or 8.1 you are running now. Let’s start with an easy one. You bought a computer from a big box store or online and it came with a copy of Windows 7, 8, or 8.1 on it and you activated that. Congratulation! You quality for the free upgrade and you should have already received a notice via Windows Update that your computer is ready to upgrade on or after July 29. Microsoft got this one right. Pushing Windows 10 out via Windows Update and notifying users in advance is brilliant and the way it should be done. It also shows the future as Windows 10 is the final version of Windows and will be further updated via Windows Update. But what if you are running Windows 7, 8, or 8.1 and you didn’t get the update notification from Windows Update? This is where things get complicated. There can be several reasons for this. One is that your copy of Windows is non-genuine. That means the activation code you used to activate Windows is no longer valid or was never valid. Microsoft said originally that all non-genuine copies would be upgraded but later clarified that only certain types of non-genuine software would be upgraded. You can avoid this issue completely if you make sure your copy of Windows is genuine and running with a valid, genuine, single-use activation key. Another reason you may not have received the update notification is if you are running Windows under a licensing agreement. Microsoft has numerous licensing agreements for school, charities, and enterprises that are essentially software leasing programs. This allows the organization to lease the software as opposed to purchasing each installation individually. For organizations with hundreds of computers, this can save a lot of money over an operating system’s life cycle. Leased software will not automatically upgrade but rather must be upgraded when the organization renews their lease. Since the organization doesn’t actually own the software, it won’t upgrade unless the lease is kept current. As opposed to a computer you purchased at home, you own the software outright and qualify for the free upgrade because you paid full price for Windows with your computer hardware purchase. An organization leasing Windows didn’t do that and as such must pay for another lease term before they can upgrade. For an organization on some sort of agreement, this shouldn’t come as a surprise. It isn’t as if the organization is not going to renew their Windows lease when it comes up. It just means they will have to push out the upgrade to Windows 10, as users using leased software won’t receive an upgrade notification. Organizations using this type of licensing will receive a new activation key to use when upgrading and activating Windows 10. This gives organizations control over the upgrade process and avoids an IT nightmare of users upgrading their computers on their own and potentially breaking links to applications within the organization. Admittedly Microsoft licensing isn’t’ all that clear to begin with and Microsoft didn’t do themselves any favors with the way they announced and then continued to re-explain that Windows 10 was free for everyone. If you are an individual user using Windows, on a computer you bought and activated then you should have received your upgrade announcement by now. If you didn’t, then check to see what kind of Windows activation key you have. If you are a user on a machine with a copy of Windows that is owned by an organization then check with your organization’s IT department to see if you can upgrade. The sooner you start checking the better. Windows 10 will be worth it.